The first draft of my book is nearly finished! I'm so close to finishing the first draft, and I'm pretty excited about it. Writing a book is a big process: I've quite enjoyed it but it's also been hard work. In November/Decemeber 2016 I will be doing a two week residency at a local arts organisation, doing nothing but writing, and it's going to be great to do that final push to finish the draft, without other distractions. I'm having two weeks off all other work; my part time job, design work, making art, [but not housework unfortunately] so I can really concentrate. Because I haven't written anything this long before, [it's up to about 95,000 words - and hoping to edit it down to a very crisp and energetic 65,000] you don't realise how hard it is to remember what you have already written, whether you are fully covering the topics you want to. It takes a few hours of reading just to see what's in there or not, so I expect I will be spending the first few days just reading and taking note of what I have missed. Then I will begin the even bigger process of chopping it down and making it unputdownable. The book is primarily about how to have ideas for making art, but it covers lots of topics that will help you to become the artist you want to be, such as: how artists think and work, what makes artists special, how to re-awaken your creativity. In the last few years I have spent quite a bit of time working at a shared studio. And apart from art school this has been my only experience of working in a space with others and it has been fantastic. I had spent most of the preceding years working alone. Unusually the studio space I worked in is a collective/ communal space so there were other people there working most days too. So I have basically been talking to a lot to other artists for the first time in many years. And it’s been very special. I have had the chance to see what other working artists are like at work. How they use their time, their creative rhythm. What they find difficult. And to talk to them about what they are making, why, where their ideas come from. So I feel excited to be able to share this information with you and to offer you even more methods to help your ideas flow. Most books about art are not about becoming an authentic artist through the use of your original ideas. Instead they focus on techniques for a specific medium, or they give you a small number of projects to try, or they focus on creativity in a general sense. 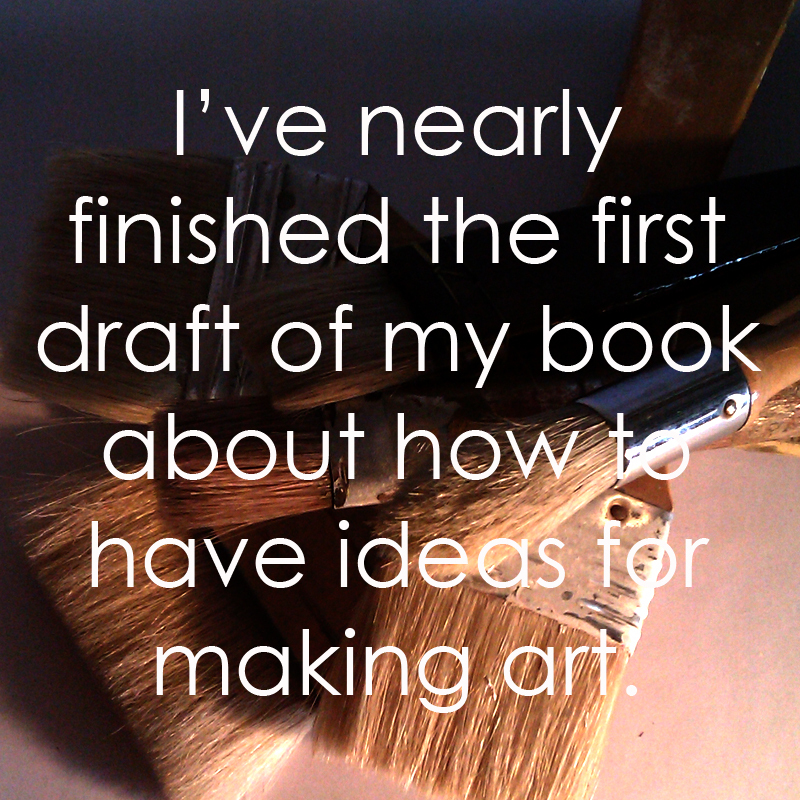 My book will be focused on the beginning of a genesis of ideas and a permanent creative habit. The focus is upon curiosity and exploration. Most art ideas start very small: a tiny speck of an idea, and that is all you need to begin, to make something. In other words: you will become an artist. Help you to hear your own ideas and creative thoughts. Help you to generate ideas, sort through them and expand upon them. Help you to choose a medium and way of working that suits your ideas. Will get you making art. Encourage you to form a creativity habit. It builds your confidence in your own ideas and art making abilities and encourages your mind to think like an artist constantly having new ideas. Helping you to visualize, work through, plan and ultimately manifest your ideas as artworks. Who will the book be for for? Have you ever had that moment where you sat down and you wanted to make something or paint something and you go blank? The clean white page or that box of tidy new pastels drove your ideas from your mind? Or you had a great idea, but you didn't jot it down and you've forgotten it? Or perhaps you area beginner and you just don't know how to start. Could you really become an artist you wonder? Are my ideas good enough? Anyone who wants to make better work, or wants to start practicing as an artist. The site is aimed primarily at people who want to be visual artists, but has value for all sorts of people who want ideas and to express them. The book will build upon this simple notion: that we all have ideas but don't always listen to them. 5. We can form an art making habit. What will the book do? Define the moment that is creative, and help you to identify when you are having ideas and what to do with them. Being open to thoughts and connections. If needed, use triggers, encounters and exercises to more generate ideas. You are shown how to jot down, record, note and scribble your ideas down, without censorship or judement. We teach you how to sift through your various ideas and find out how to choose which idea to make . After you have chosen an idea, you learn how to expand upon it, sometimes adding depth and meaning and define what you are trying to do with this artwork. Expressing your original ideas. Helps you to choose appropriate means of getting your idea out of your brain and into the world, choosing the right medium and process to make that art work rock. If you are interested in further updates from me about the book you can check the blog or check the Facebook page.